There is nothing like a refreshing salad on a hot, summer day! Who am I kidding? I eat this year round. It’s so good and such an easy way to get your veggies in without wanting to pull your hair out! Did I mention it’s super low calorie?! Oh, and it’s easy too. Probably the easiest thing you’ll ever make next to cereal. There are a few ways you can make this. 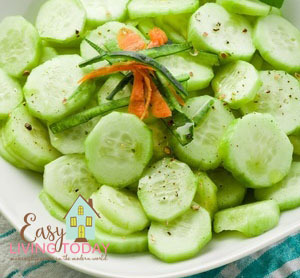 I prefer to eat it with just cucumbers, but you can also throw in tomatoes or onions- especially if you want to add more veggies. This serves 1, so multiply as needed! Peel and then slice your cucumber. If you are using tomatoes, slice those as well. Throw it all in a bowl and squeeze half of a fresh lime over mixture. I recommend taking a bit as you are squeezing the lime to make sure it’s not too much lime for you. I like a LOT of lime, but not everyone does. Just keep adding the lime juice to taste. Add salt to taste. You can also add a little pepper if you’d like, but I prefer it with just lime & salt. Containers: 1 or 2 greens depending on how you make it. If you do 1C cucumber and 1C tomatoes, that’s 2 green. If you do 2C cucumbers, still 2 greens. If you just do 1C of cucumber, that’s just 1G.